In the early part of the 1980s, the New York Islanders were the team to beat and young Wayne Gretzky was the one-of-a-kind superstar re-writing the League's scoring history. Those two forces would finally collide by the end of the 1982-83 season. It was a meeting that seemed inevitable. While the Islanders would hold off the Oilers in stunning fashion, the Oilers established their place among the League's elite. In our fourth installment on the NHL in the 1980s, I'll focus on the Islanders-Oilers showdown as well as the stories the ruled the ice during the '82-83 campaign. After failing to win their division and falling to sixth place in the overall standings, the Islanders found their way in the postseason, going 15-5 en route to their fourth straight Stanley Cup triumph. In the Cup Final, the Isles were matched against the young and powerful Oilers, who'd pushed the champs to six games during their second-round series in 1981. Two years later, there were many pundits who thought the Oilers would be too much for an Islanders team that was showing signs of wear and tear from having played so many games over the past three years. To make matters worse for New York, super sniper Mike Bossy was a late scratch from the opening game of the series in Edmonton because of an illness. Even without Bossy, the Isles scored a 2-0 Game 1 victory behind the feisty goaltending of Billy Smith, who would prove to be a difference maker in the series. The Islanders followed that with 6-3 and 5-1 victories in Games 2 and 3, respectively. They completed an impressive four-game sweep with a 4-2 triumph in front of a delirious home crowd. Smith, who surrendered just six goals in the four games, was awarded the Conn Smythe Trophy for his fine play. In receiving the honor from then-NHL President John Ziegler, the Islanders' blue-collar netminder candidly admitted he'd taken a dive to draw a five-minute major penalty against Oilers forward Glenn Anderson in Game 4. Smith explained he was moved to do it because he felt several Edmonton players were similarly exaggerating to get the attention of the referee. 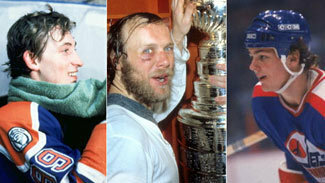 Years later, several Oilers stars saw the defeat as a necessary learning experience. In fact, Wayne Gretzky and Mark Messier both admitted they were impacted by walking past the Islanders dressing room after Game 4 to see the four-time defending champs sitting with ice bags, rather than engaging in a wild championship celebration. In their minds, they were made aware that more sacrifice would be needed to climb the final rungs to a title. The Islanders, meanwhile, took their place among the very few franchises in North American pro sports history to win four consecutive championships. And they ran their Stanley Cup Final winning streak to nine straight games, dating back to the 1981 Final victory over the North Stars. For the first time in his mindboggling four-year NHL career, Gretzky's numbers moved a slight bit backwards. Then again, it's kind of hard to match 92 goals and 212 points! In '82-83, the Great One finished with 71 goals, 125 assists and 196 points, leading the league by a significant margin in all three categories en route to his third consecutive Art Ross Trophy and his fourth straight Hart Trophy. In the playoffs, Gretzky averaged more than two points per game, scoring 12 goals and dishing out 26 assists for 38 points in 16 games. In his first Cup Final appearance, he assisted on four of the team's six goals, but failed to light the lamp himself. In Edmonton, Gretzky and his talented teammates were making scoring goals look almost too easy. By season's end, they established a record, scoring 424 goals, eclipsing the mark of 417 they'd set a season earlier. Gretzky, Mark Messier, Glenn Anderson and Jari Kurri accounted for exactly half of the regular season output, combining for 212 goals. In all, eight Oilers scored 20 or more goals and another five reached double-digits. With second-year coach Gerry Cheevers in charge, the Adams Division-winning Boston Bruins grabbed the regular season title, rolling up 110 points. The club was led offensively by 1982 Calder Trophy runner-up Barry Pederson, who potted 46 goals and a team-best 107 points and sharp-shooting winger Rick Middleton, who scored a club-high 49 goals and 96 points. Fourth-year defender Ray Bourque (73 points in 65 games) led an experienced blue line that included Brad Park and Mike Milbury. In goal, former Flyers stopper Pete Peeters was rock solid, putting up a 40-11-9 mark, a 2.36 goals-against average and eight shutouts. Those numbers earned him the Vezina Trophy and he finished as runner-up to Gretzky in the Hart Trophy balloting. In the playoffs, the Bruins eliminated the Nordiques and Sabres en route to the conference finals, where they were stopped by the Islanders. After the sale of the Colorado Rockies following the 1981-82 season, the franchise relocated East and was re-born as the New Jersey Devils. Because of the geography of the move, the League made a slight adjustment. The Devils would compete in the Patrick Division, alongside the Flyers, Capitals, Penguins, Rangers and Islanders. To compensate for their departure from the Smythe Division, the Winnipeg Jets were transferred from the Norris Division to the Smythe. The change didn't translate into much success on the ice. The Devils finished with just 48 points, one less than their total from the previous season in Denver. The '82-83 season marked the end of the long careers of defensemen Serge Savard and Carol Vadnais as well as right wing Wayne Cashman, the last three active skaters who'd started in the pre-expansion "Original Six" era. As it turned out, none of the three garnered significant experience in that era. Cashman had played a single game for the Bruins during the '64-65 season, while both Savard (two games) and Vadnais (11 games) skated briefly for the Canadiens during the '66-67 campaign. The rugged Cashman became the last of the trio to complete his playing career, advancing with the Bruins to the Wales Conference Finals (where they were eliminated by the eventual-champion Islanders). Savard was the most distinguished of the three players. The long-time Habs defender was part of eight Cup-winning teams, earning induction into the Hockey Hall of Fame in 1986. The 1982-83 season was a particularly good one for fans north of the border. All seven Canadian franchises (Quebec, Montreal, Toronto, Winnipeg, Edmonton, Calgary and Vancouver) qualified for the playoffs. Unfortunately, four of the seven were matched against one another in the opening round of the Smythe Division playoffs. Interestingly, Edmonton and Calgary -- the winners of those first round Smythe matchups -- were the only Canadian teams to advance to the second round. Quebec, Montreal, Toronto, Winnipeg and Vancouver all were first-round losers. This occurrence -- all active Canadian-based franchises making the playoffs in a single playoff year -- hasn't happened since. The unheralded 120th pick in the 1980 NHL Draft, Blackhawks wing Steve Larmer made quite an impression during his rookie season, putting up 43 goals and 47 assists for 90 points in 80 games. Those numbers earned him the Calder Trophy nod over slick defenseman Phil Housley. 'The Great One' shined the brightest in the 35th NHL All-Star Game on February 8, 1983 in Uniondale, New York. In a span of 12:58 in the final period, Gretzky scored four goals, three of which were assisted by Edmonton linemate Mark Messier. In that rookie campaign, Larmer began an 884-game Iron Man streak that would run through the end of the '92-93 season, ending, sadly, via a contract dispute rather than any injury that kept him down. In all likelihood, he would have broken the League mark for consecutive games held by Doug Jarvis (964). That rookie class also included Scott Stevens and Dave Andreychuk. Those two players would work for more than two decades before eventually hanging up their skates. 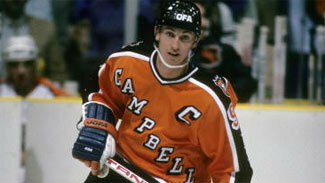 Gretzky earned the first of his three career All-Star Game MVP trophies in grand fashion, scoring four third-period goals to lift the Campbell Conference to a 9-3 blowout win over the Wales Conference in a game played at the Nassau Coliseum on Long Island. To date, Gretzky is the only player in All-Star history to score four goals in a single period. In the history of the event, Gretzky is among five players (Mario Lemieux, Vincent Damphousse, Mike Gartner and Dany Heatley) to score four goals in a single All-Star Game. Gretzky and Lemieux share the record for All-Star goals, each compiling 13. Entering the season, the league decided to re-set the number of players allowed to dress for each game, expanding that number to 18 skaters and two goaltenders. Previously, clubs could dress 17 skaters and two goaltenders, dating back to a 1971 rule change. Interestingly, there were times in League history when teams were allowed to dress fewer players for road games than home games. That was likely done to save on travel expenses.